I’m sure that almost all of you have read the book or seen the film, "A Christmas Carol". It has become such a successful Christmas classic and has become a part of us and the holiday season. This project was inspired by the Charles Dickens classic. Don't you just love the spin I put on the ever popular lantern file by making it a lamp post!? 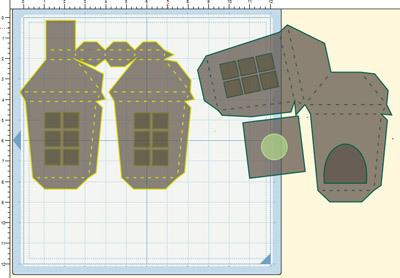 In the lantern1.svg and lantern2.svg files, break apart and delete the flourish window. Open up window.svg file, break apart, delete the frame, regroup, and bring that over to one of the lantern sides. Copy and do that to 3 sides. Take the empty roll and wrap black cardstock around it using double sided tacky tape. This will become the post. Measure the diameter of your empty roll. Take the circle.svg from the Shapes Library and adjust it to your diameter. Place that circle in the center of the lantern base (see diagram). Cut. Print vellum yellow using your printer. 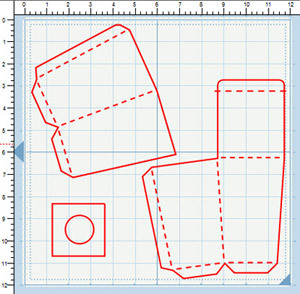 Then cut the vellum to approx 2” x 3” rectangle – adhere to the back of the lantern. Assemble. Take the post and drill/make a hole about 3 inches below from the top, going through both sides. Cover the wooden dowel with black cardstock, like the post. Insert the dowel through the hole. I used permanent black pen to color the rod ends. Insert the post into the bottom of the lantern. Using glue gun, secure it to the bottom. On the box.svg file, take that same circle.svg (same diameter) and place it in the middle of the square, as per diagram. Cut. Assemble the box and insert the post in the circle opening, and secure it from underneath using glue gun. Adhere the ribbon around the post using double sided tacky tape. Cut the sign.svg, embellish as needed, and adhere to the dowel. 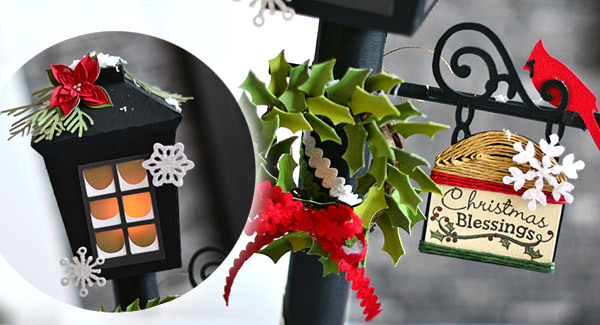 Cut green_leaf.svg from the Holly set and adhere them to the twig wreath using hot glue gun. Add ribbon to the bottom of the wreath. Make the crate, cut snowflakes (glue on snow glitter onto them), cut the rest of the embellishments and adhere them onto the lamp post. 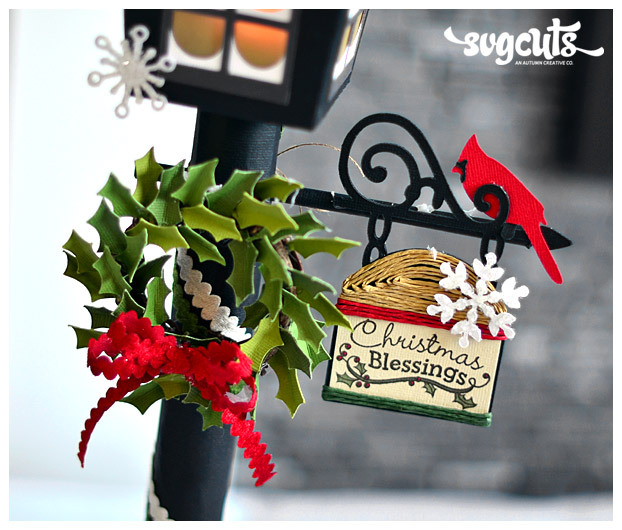 (For the ‘Christmas Blessings’ stamp, I just stamped, colored and cut it out to fit the sign.svg). Insert a battery-operated tea-light inside, and you’re done! By printing on a vellum, you can create any colored light, or even print a pattern on it. It’s a good idea if you are adding on new embellishments that you cut/assemble all that you’re going to add, and then think about the balance of the project before adhering them all to the project. Wouldn’t this make a beautiful table decoration for your next party? Add your tea light, and instantaneously, a beautiful and magical scene is created right at your table. P.S. you really make some cool stuff, I wish I could think up this sutff. Thanks for sharing your talent. Hey Danielle! That is so cool that you’re making my project! As for the tube – mine was 14″ – it’s from the wider parchment paper roll… I know that there’s wider alumininum roll ones out there, too. and yes, I did put the tube to the bottom of the base, and another good tip, which I forgot to mention is that you can put a weight inside the box at the bottom to keep it stable (I didn’t put any, but it probably will make it sturdier!) Anyway, thanks for your comment and I hope to see it when it’s done! Post it on the SVG Cuts wall and my Mod Paperie page wall! I hope it looks good enough to post, well see how it turns out. Thanks for you help, I have it all cut and will work on putting it together this week. I am really excited to see how it turns out. Next I want to tackle your Autumn wreath, maybe I should try a winter one, getting a little late for Autumn. OMG! I have just the lamp post itself put together, no pretties yet, and it is so awesome. So now I need to decorate it. This is really a cool idea. Thanks so much for coming up with this idea. When I show my Grandma, she’ll have to have one too. Glad everything is working out so far! Have fun decorating! Can’t wait to see! You have an amazing talent! This is so pretty! Thanks for sharing your creativity with us! Love this project. As I told you on your blog…STUNNING! :) Hugs! This is beautiful! I love how you used the snowflakes, great touch! I don’t know Thienly I think this may be my favorite project of yours now, it’s unbelievable!! The detail you put in is amazing, you always do, I totally love it. 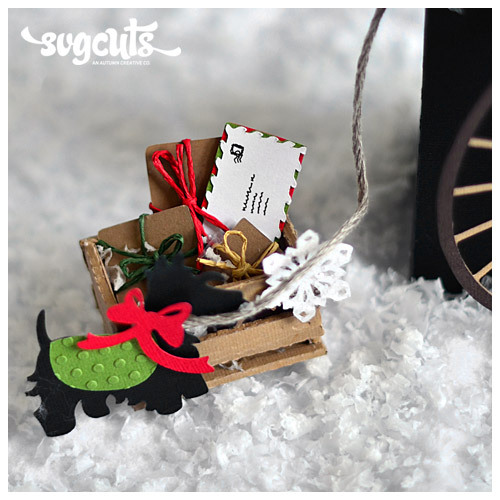 SVG Cuts has the most talented design team and I love to see how you all use Mary’s wonderful svgs, very inspiring!! Thanks so much Brigit! Yeah, it’s my mom’s fave of mine so far! Thanks for your comments and yeah, this DT is pretty awesome – we all get along so well, too! OMGosh! That would be way too cool – I’ll pass this idea onto Mary! YOU ARE AMAZING! 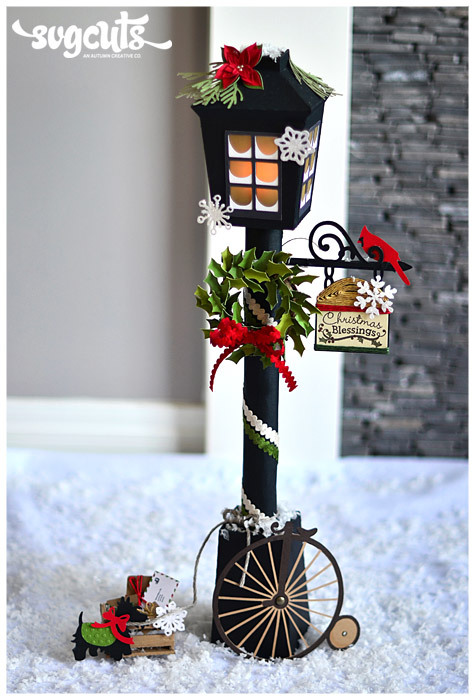 So much creativity went into this….SO MUCH detail…..it’s just too pretty for words! I love seeing what you do with all of the SVG files. You are so very talented. I LOVE THIS !! Thanks for all the effort you put into the instructions too! 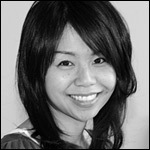 We are all so fortunate that you are part of the design team! A fan forever…. Aww… thank you Debbie! It’s so great to know that my work is being appreciated and people are inspired by them! Yeah, I love putting details into my projects – but sometimes it can get a little too busy, so I’ve gotta watch that! lol.. Anyway, your comments mean so much to me, and I am very fortunate to be a part of this wonderful team! This is amazing! I’d love to have a video tutorial for this protect since i’m still learning my English and is still hard to understand written instructions… :( but you are so talented! P.d. I wrote this with some help! LOL! Thanks so much! I think that you did awesome writing your comment – it’s perfect! Yes, we were thinking of doing videos, but just couldn’t get it done on time… I’ve actually never have done a video, but would you like maybe a little tutorial post on my blog with step by step pics? That is just sooo adorable. I have to make one. LOVE IT. Thank you so much for sharing. Love to see your version if you ever make one – make sure to post it onto SVG Cuts FB wall, or my Mod Paperie page FB wall! Thank you so much, Kerry! :) As for the cuts – I cut this on the Cricut Expression using AC Cardstock. I find that the cardstock makes a huge difference in how clean it cuts, and I recommend this brand for all solid cardstock. It has a colored core, so no white showing through – like many other brands. It has a nice weight to it, too! 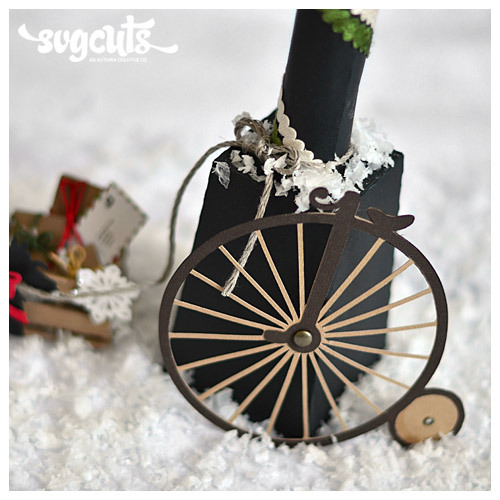 I recently was given a Sizzix Eclips cutter as a Christmas bonus from SVG Cuts (and it’s supposed to cut amazing!) – so I’m sure I’ll be using that from now on! 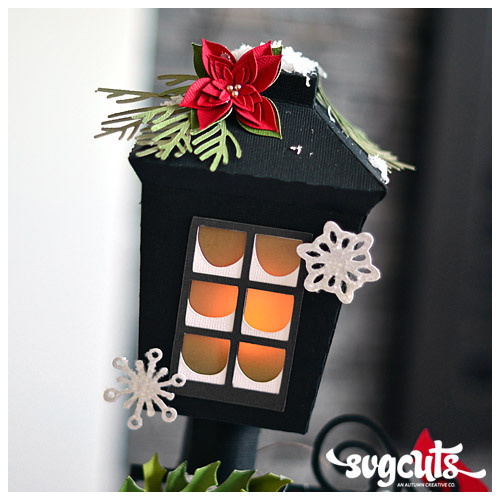 My crafting goal this year is to make a complete Santa’s Winter Village out of SVGcuts designs for the kids to enjoy and this will definately be a part of it!! Thank you! !